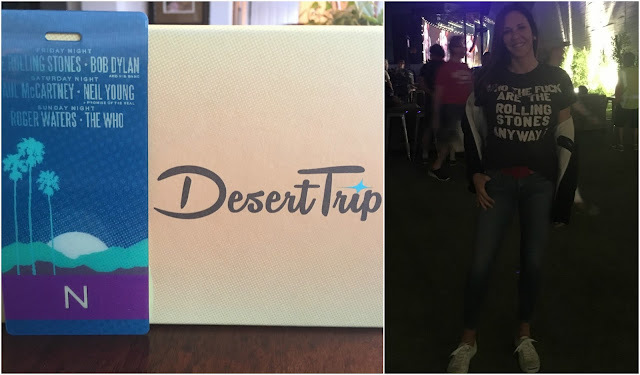 with the stones, bob dylan and paul mccartney to name a few, desert trip -- aka oldchella, was everything i thought it would be as well as everything i didn't. the lineup was amazing and i knew the music would be phenomenal but the thought of sitting amongst 100k plus concert goers in the heat, in the dust was not at the top of my to-do list. the ticket buy was an extraordinary impulse the likes of which we seldom fall prey but we got wrapped up in the hysteria and a few weeks later decided we must have been crazy. we just aren't big festival fans. not having any success in reselling, we decided to go. opting to take our car instead of the shuttle gave us peace of mind knowing we could leave anytime we wanted. i could not have been more thrilled once my phobia of crowds and dirt were allayed. one fantastic artist after another revved the (slightly geriatric) crowd into a feeding frenzy. 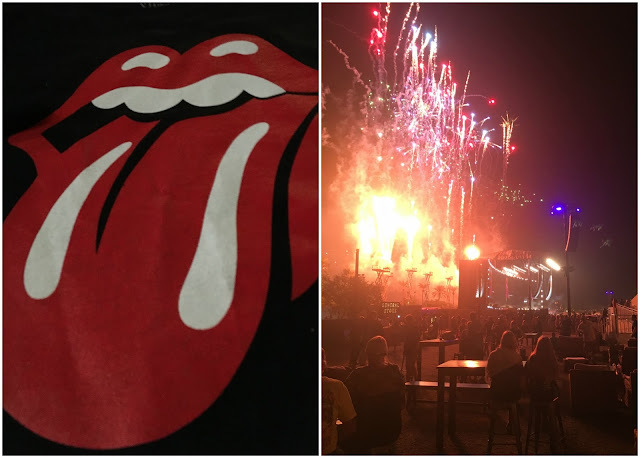 mick jagger did not disappoint as he pranced around the gigantic stage while paul mccartney surprised us with rihanna dropping by for a duet of "fourfiveseconds". the highlight of my evening for sure. jagger called the fest "catch 'em before they croak", roger daltrey stated he felt like he was "standing in front of a blow dryer amidst puffs of smoke" and neil young threw "seeds" into the crowd in his protest of california distribution laws on marijuana seeds... let's just say the show had more than a few moments. with mother nature blessing us with a rare shooting star, a noteworthy fireworks display and the most perfectly temperate nights, desert trip was nothing short of magical. i was born on paul mccartney's birthday. i had the chance to meet him a few years ago and i can say in all honesty he's a truly nice and very humble guy. my father came home from what he called the "fat farm" where he had shared a room with keith moon of the who. my dad had no idea who "the who" was, much less keith moon. needless to say, they made fast friends. my dad came home with tickets for my brother and i to the who's san diego show along with all access passes and a promise his new friend would make sure we'd be well taken care of. the fact i didn't really know much about the band (my older brother was a huge fan) didn't lessen the blow when my mother put a quick halt, stating our age, to any concert plans we were concocting. i used to box at bob dylan's private gym but other than a few hellos and how are you?, i had just one conversation with him when he came and sat next to me asking if i was the "perfume lady". he was wondering if i could make a scent that said "go away" to use when he was tired or wanting some solitude. he went on to tell me he had bought a foul smelling something or other years earlier at a toy shop and admitted he'd put it in the corner of the buffet table causing everyone to say an early "goodnight". the stinky scent never came to be but i got a kick out of it and a memory that's nothing less than surreal.